Some major holidays are coming up. The gift giving season for many. Time to knit those sweaters, mold that fruit cake, endure Black Friday nonsense, and consider what color socks and underwear to get your youngest. Or maybe you’re not even there yet. Maybe you have no idea what to get that someone special in your life… that one person who has seemingly everything — because, let’s face it, they probably do. Well, we have an idea for you: how about giving them the gift of adventure? The activity won’t last forever, but the memories most certainly will. 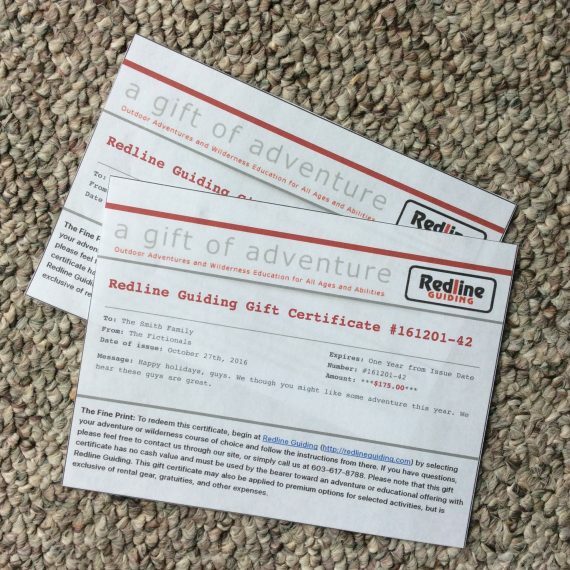 We now offer gift certificates here at Redline Guiding good toward any of our outdoor adventures and wilderness education offerings. To finish with your shopping early, avoid the crowds, and come up with something cool and different instead of the same-old, same-old, request a gift certificate today.